The Auschwitz-Birkenau complex was the largest concentration camp the Nazis established in Europe. The site has been preserved to ensure every generation can bear witness to the brutal and inhumane treatment that was shown to other human beings. We recently visited the site during our week in Poland. Suffice it to say the experience of touring this awful place will remain with me for the rest of my life. The preserved, authentic Memorial consists of two parts of the former concentration camp: Auschwitz I and Auschwitz II-Birkenau. A guided visit makes it possible to understand this unique place more fully. This requires at least three and a half hours. At first, the Germans held Polish political prisoners in the camp. From the spring of 1942 Auschwitz became the largest site for the murder of Jews brought here under the Nazi plan for their extermination. More than 1,100,000 men, women, and children lost their lives here. 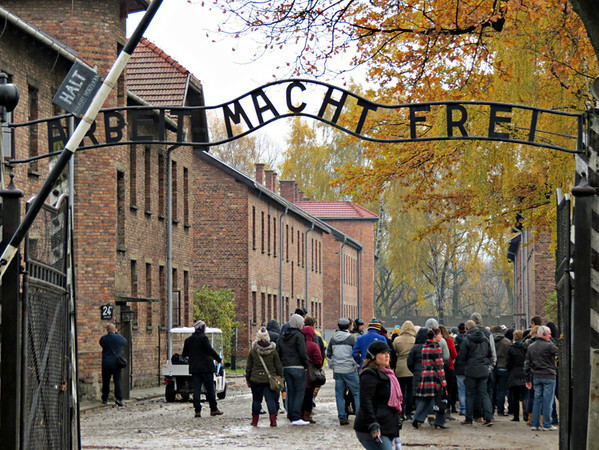 The dramatic authenticity of this place lends exceptional significance to the educational activities carried out here, stretching between the tragedy of Auschwitz and vexing contemporary problems. Also from the site: The deepest symbolic meaning resides in the personal effects of the people, mostly Jews, brought to Auschwitz by the Germans from all over occupied Europe for the purpose of being killed. There are thousands of items of everyday life such as kitchen utensils, shoes, eyeglasses, shoe-polish containers, brushes, and combs. They bear witness not only to the scale of the plunder carried out by the Germans, but also to the suffering and death of their owners. Suitcases with names, birth dates, transport numbers, and addresses have important documentary value and are often the only proof that a given person was deported to Auschwitz. Most persons walking under this sign never walked back under it again.